Show Time: 12:30 pm daily. This theater features a large glass tank and you’ll be able to watch dolphins perform from above and below the surface of the water. This aquatic theatre allows you to witness the beauty of marine animals moving underwater. Our trainers will narrate the show, which may include penguins, sea lions and dolphins. You’ll also learn about the newest training techniques and Sea Life Park’s conservation efforts. Show Times: 10:00 a.m., 2:00 p.m.
5/1/17 – 8/31/17 with additional time at 4:00 p.m. Lion ShowSmart, fast and funny, our California sea lions are a pleasure to watch. 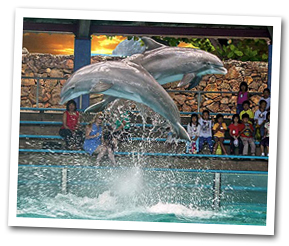 You’ll be surprised and delighted by their underwater acrobatics and above-ground antics. 11:15 am & 2:50 pm daily. 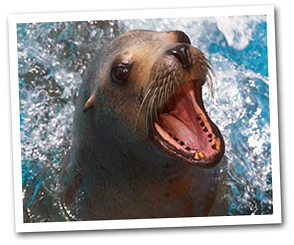 Sea Lion feedings ($10) take place in our Sea Lion Feeding Pool, near the café area. Our crew of adorable Humboldt penguins are able to leap out of the water like bullets and walk upright. Hear all about the aquatic bird species during this trainer-led forum. Here you’ll be able to see 11 so-called Humboldt penguins, which are native to South America and also an endangered species. This habitat at Sea Life Park serves as a comfortable breeding site. NEW! Children of all ages get excited about the NEW Discovery Reef Touch Pool, where they can carefully lay their hands on starfish, urchins, and even baby honu (Hawaiian green sea turtles) during hatchling season. Children can even crawl into a tunnel and watch shark pups swim by. All creatures featured in the new touch pool are native to Hawaiian waters and tide pools. Plus, Sea Life park’s expert staff will be there to share fun facts. *Touch Pool species subject to change. Sea Life Park’s Shark Cave is an excellent place to learn about the wonderful species of sharks living in Hawaii, such as the Scalloped Hammerhead, shown here. Sharks are unique in the fish kingdom, with sleek, boneless bodies (they only have cartilage, no bones) and other amazing adaptations. Our Shark Cave, designed for shark viewing and underwater shark experiences, has great new features, from the life-size shark imagery and cave rockwork on the walls to special underwater mood lighting and – most excitingly – a removal of the submersible fencing that was in place for the safety of the animals and people in the tank. Starting in July, those guests enjoying our Shark Trek experience will be thrilled to be in the water with several beautiful native sharks, fish and a 200-lb stingray with no boundary between themselves and the animals. Shark Trek uses remarkable Sea Trek technology which enables virtually anyone, even children, to submerge for long periods of time using just a helmet. The Shark Trek experience – now fence-free! At 5 years old, Nalu is the youngest calf in the Sea Life Park nai`a `ohana (dolphin family). Wholphins, too, have strong and long-lasting familial bonds, which makes sense given their genetic blend. A hybrid of a false killer whale and Atlantic bottlenose dolphin, Sea Life Park’s own Kekaimalu, meaning “from the peaceful sea,” and her calf Kawilikai, meaning “blend of the ocean,” are inseparable. Learn more about marine mammals on a trip to Sea Life Park. You can watch penguins leap out of the water, sun themselves, or listen to one of our trainers talk about these amazing animals. You might even get to see them eat! Hear about their avian characteristics as we introduce this cherished threatened species to the guests of Sea Life Park Hawaii. Cockatiels and lovebirds make up the bustling, chirping community of Sea Life Park’s open-air aviary. All guests are welcome to step inside and enjoy their company during posted hours. Feeding sticks are available at no charge. (subject to change). Single day admission includes all shows and exhibits for that day. Includes transportation from select Waikiki locations and must be reserved 72 hours prior to arrival date.